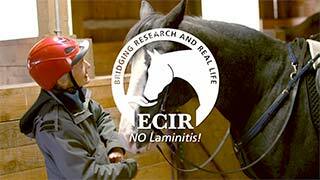 No Laminitis! Conference Proceedings 2015 | ECIR Group, Inc.
Our understanding of equine metabolic disorders, mechanisms, treatments and diagnostic criteria is continually changing. This process requires that some hypotheses be abandoned, but may also bring the realization that new is not always definitive. Past, current and proposed future scientific theories, including their real-world implications for the horse, will be presented. In women, there is a well-described syndrome of ovarian cystic disease (PCOS — Polycystic Ovarian Syndrome), which is accompanied by insulin resistance. Individual cases of mares with severe insulin resistance refractory to good control by the usual diet measures alone, and who have been found to have one or more features similar to PCOS in women, will be discussed. Reproducible positive outcomes through testing and simple treatment options will be reviewed. The cornerstone of dietary support for thousands of ECIR Group horses has been a low-sugar/starch, forage-based, mineral- balanced diet. Nutrient recommendations are evidence-based, from the National Research Council, "Nutrient Requirements of Horses" and additional peer-reviewed studies. The collective experience of 13 years has continually demonstrated that relief of acute laminitis pain due to hyperinsulinemia can often come within one to two days. Special considerations, however, such as chronic pain, can require support which might include adjunct amino acids, antioxidants and adaptogens. The pharmacokinetic mechanisms of supplemental nutraceuticals will be discussed. Cold weather can sometimes induce severe hoof pain in horses with EMS even when control of PPID, diet, and physiologically correct trim are in place. In some cases there may or may not be a prior history of acute laminitis. Potential hormonal and circulatory changes behind this phenomenon will be discussed. Origins of the concept of an equine metabolic syndrome as a risk factor for laminitis will be presented and the manner by which it has been characterized over the years discussed. Present understanding about equine metabolic syndrome has evolved significantly since it was first proposed and the current thinking about what constitutes this common equine medical problem will be presented. Although most classic laminitis research throughout the antecedent several decades has been centered on that associated with toxemia and gastrointestinal disease, an explosion of new knowledge has resulted from the realization that most cases of laminitis result from endocrinological disturbances such as metabolic syndrome. Placing the new discoveries and their implications into the pantheon of equine laminitis research over the years will be presented. Some of the most exciting and novel research with implication for both human and animal health is centered on the microbiome. In this lecture, the concept of an equine microbiome will be introduced and explained with emphasis on how this remarkable organism might be playing a role in common equine diseases such as laminitis and metabolic syndrome. *Laminitis: Why is it good for the coﬃn bone to be porous, while in women we call it osteoporosis? The coﬃn bone has long been viewed to be normally very porous in the dorsal cortical bone. We call similar findings in the legs and feet of women osteoporosis and they are viewed to be unhealthy. We will discuss where there is a difference and how this potentially impacts laminitis. *Laminitis: The suspensory apparatus of the coﬃn bone and its function in health and disease. The suspensory apparatus of the coﬃn bone is viewed as crucial in a healthy foot. This presentation will review what makes a healthy suspensory apparatus, how f oot tissues viewed via microscope are compromised prior to laminitis, and the eﬀect the tissues and suspensory apparatus can have on rehabilitation. *The Vascular Cushion of the Frog: What does it do? This lecture will show histological evidence that most of the blood flow to the foot passes to the rear of the foot, providing support and dissipating vibrational energy. *Nerves, Nerves, Nerves: Why are they so important to the horse? The horse's foot has a wealth of sensory nerves. Ongoing research will be presented to show how the foot is innervated and the impact nerves have on blood flow and comfort in all gait abnormalities, especially acute and chronic laminitis, and founder. You have the right diagnosis, your diet is forage-based, tested and balanced, you are even on the path to exercise, yet things are still not right. Too often the trim is the last, forgotten, part of rehabilitation. Learn the simple methods used to recognize common hoof capsule distortions and how to determine the corrections needed to realign the hoof capsule with the bony column. When rehabilitating foundered horses, having the right Team is critical to success. In this presentation the audience will learn the important components of the right Team and tips for success on developing them. Detailed case studies demonstrating the critical role of correct diagnosis, diet, appropriate exercise and the right Team are presented in this lecture. Hurdles which were overcome in real life scenarios will be presented. The nutrient content of the bulk of the equine diet pasture and hay is often not considered. In horses with PPID or IR, emphasis is placed on the carbohydrate content. Which carbohydrates matter? What other nutrients? Why is feeding poor quality hay to horses with metabolic issues a bad idea? The benefits of forage analysis and mineral balancing will be discussed.